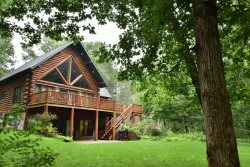 Brentwood is the perfect get away for a family or group of friends for a Wisconsin Dells get-away. Relax in the family room where you will find a 55" TV for the games and gas fireplace for Wisconsin winters. There are 4 HD4K TV's and WIFI. Enjoy the large exterior deck or fire up the gas grill for a family cookout. There is also a fire pit for a bonfire. This 4 bedroom, 3 bath 2-level farm-style home is equipped with all your needs including a fully equipped kitchen with stove, refrigerator, microwave & dishwasher, large dining table with banquet seating, central A/C and heat, washer/dryer and garage. Set on the large grassy lot with plenty of room for kids to play or for adults to enjoy a game of bags. Brentwood is just minutes away from all the Dells attractions or hiking at Mirror Lake State Park and a short walk to Outlet at the Dells Mall. Rental of Brentwood from Memorial Day weekend until Labor Day weekend will also give you exclusive use of Free water activities at Jellystone Park with 25 water features and 4 water slides. Designed with the teens in mind for high energy the adjacent activity pool area has a great tri-spiral waterslide, basketball hoops along with a floatable turtle. Parent can relax in the hot tub while sipping a cocktail from the poolside bar. King (m) w/TV, Queen (m), 2 sets of Bunk beds (m), Full (u) w/TV; also 3 Queen sofa sleepers in the home and built-in crib. Extensive water area includes: children's activity pool 0-2' deep, 4 levels of water fun. 8' spiral slide, 6' twist slide, 6' speed slide, 4' twin competition slide, dumping water buckets, water canons, tip trays, water wheels, geysers & waterfalls. The activity pool is 3-5' deep with 25' high tri-spiral waterslide, water basketball, floatable turtle & water volleyball. The water area spans over 10,000 square feet and contains over 25 interactive water activities and 4 water slides specifically designed for children ages 3-12. Loved it! Was more then I could have imagined and perfect for our group. The Brentwood house was clean, spacious, secluded, & beautiful! When looking at the pictures online I was pleased with what I saw but in person it was unbelievable how beautiful it was! Definitely exceeded my expectations! Sunday – Thursday 10 am-6 pm, Friday & Saturday 10 am-8 pm. The Water Park Capital of the World has the only campground in Wisconsin Dells with FREE water activities INCLUDED FREE WITH YOUR STAY! Families with children will have a blast at the only water playground with a Jellystone Park™ theme and Yogi Bear™ characters teeming with 25 water features and 4 water slides. Designed with the teens in mind for high energy the adjacent activity pool area has a great tri-spiral waterslide, basketball hoops along with a floatable turtle to burn up the energy. Relax in the hot tub while sipping a cocktail from the poolside bar. Open May 25 – September 3, 2018. (available by request for special groups). The water area spans over 10,000 square feet and contains over 25 interactive water activities and four waterslides specifically designed for children ages 3-12.